“Wait just one cotton-picking minute, Unk. I know you and Miss Dorothy have been married for dang near twenty years.” Right you are Skeezix. My honeymoon with my lovely bride is not the subject this morning. What I am talking about is what I recounted in this post many a moon back, muchachos. A honeymoon is, among other things, traditionally “a period of adjustment,” and I dern sure went through that with my ETX125, Charity Hope Valentine. I see the blank and puzzled expression on your mug, Johnny B. Novice. And that makes me feel a little sad. I still have a hard time believing the legendary and beloved ETX is no more, and that some newbies have never even heard of it. 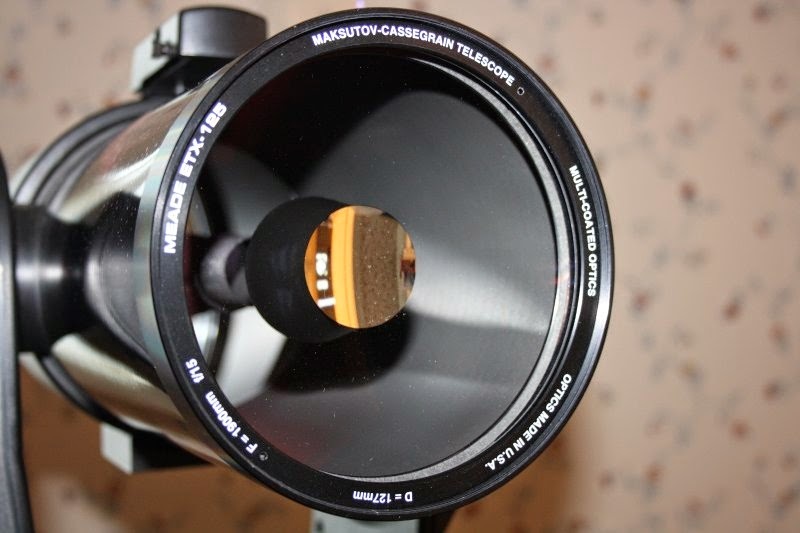 OK, OK, I’ll tell you what an ETX was; it was the Maksutov Cassegrain telescope (MCT) that made Maks popular and affordable for us proles in amateur astronomy. Not that MCTs hadn’t been sold to amateurs for at least 40 years before the coming of the Meade ETX; there’d been the legendary Questars and Quantums and others. The amateurs who owned ‘em liked ‘em. They packed long focal length (usually their focal ratios came in at around f/15) into short tubes and had a reputation for high optical quality. That quality came at a price, however, and before the ETX few of us could afford the Mak species of quality. The mid 1990s changed everything. Not only was Meade selling a 7-inch Mak in LX200 Classic garb, there was a flood of Russian MCTs from Intes, Intes Micro, Lomo and others. The prices were not quite as low as what you’d pay for a Schmidt Cassegrain of similar aperture, but they were far cheaper than what we’d been accustomed to. Quite a few amateur astronomers began to find out they’d been right—and wrong—about Maks. “I don’t get it, Unk. How is an MCT different from an SCT? They look the same.” And they are similar at heart. The two major differences are the scopes' main mirrors’ speeds—their f-ratios—and the designs of the corrector plates. The primary in an MCT is almost invariably slower than an SCT primary. Instead of f/2 or thereabouts, most Maks come in at f/3 or higher. That results in longer tubes, but also flatter fields. If you ain’t sure whether you are looking at an MCT or an SCT, take a gander at the front of the tube. An SCT uses a thin-lens corrector with a complex curve. It looks like a flat piece of winder glass. An MCT’s corrector couldn’t be more different. It is thick and it is deep. It is, in fact, sometimes called a “salad bowl corrector.” Its advantage? 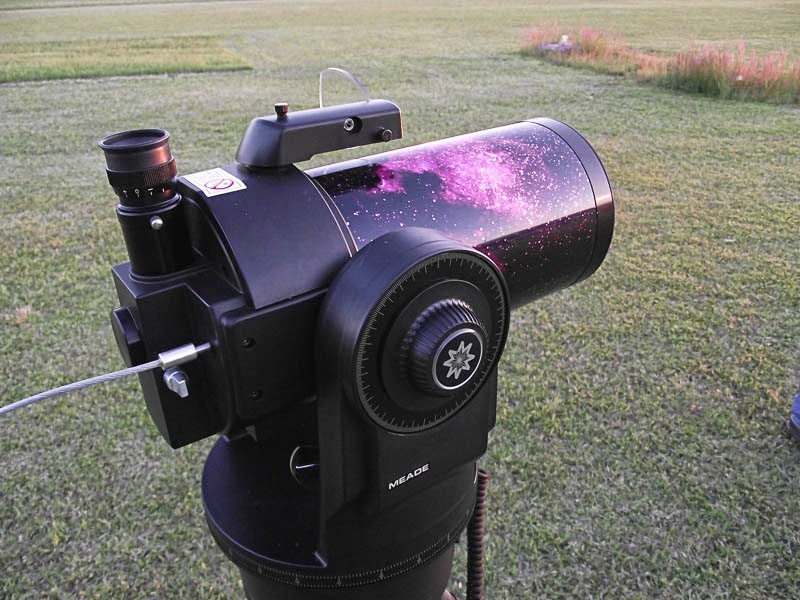 It is easier to make well than an SCT’s lens and can potentially do a better job than an SCT’s corrector at removing—correcting for—the primary mirror’s spherical aberration. Like SCTs, MCTs use primaries that are spheres (or close to it), and the corrector is essential. Disadvantages of the design? There are some, but probably not the ones you think. The biggest problem is making the thick corrector requires a right expensive piece of glass. That’s not fatal at smaller apertures, but as you get over 6 – 7-inches, it causes the price of an MCT to skyrocket. Otherwise? I know what you’ve been told, “The thick corrector makes Maks impossible to cool down. They never achieve thermal equilibrium and, so, never live up to their potential.” I used to think that till I was schooled by a maestro, Roland Christen. Seems as it is not the corrector, but the overall design of the tube that makes some MCTs hard to cool-down. For example, Meade’s 7-inch had a hard time adjusting to outdoor temperatures because of the big, heavy, heat-absorbing weight in the rear cell used to make its long tube balance on an LX200 fork. “That’s cool and all, Unk, but everybody knows the real problem with MCTs. They are slow, high magnification scopes and are only good on the Solar System, not the deep sky.” Now, that couldn’t be more wrong. Contrary to what some Newbies think, an f/15 scope delivers an image every bit as bright as an f/5 telescope when they are used at the same magnification. You just need a longer focal length eyepiece in a Mak to achieve the same power as the fast scope. More importantly, I reckon, folks forget most of the objects we look at are actually on the small side. I’ll see your handful of M31s and NGC 7000s and raise you a passel of small and medium sized galaxies, clusters, and nebulae. One of the strengths of the MCT is its potential for delivering high contrast, and that can make it not just usable on the deep sky, but a deep sky powerhouse. Where was we? 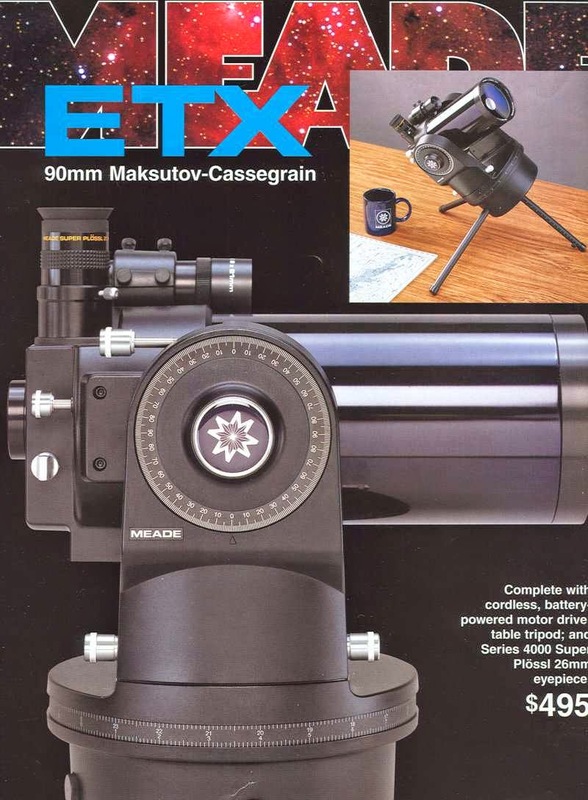 Oh, yeah… Meade and the Russkies had brought the Mak to the attention of Joe and Jane amateur, but what pushed the design over the top was Everybody’s Telescope, the ETX90, a cute little Questar “clone,” that hit the streets in ’96. It looked a lot like the telescope, the Questar 3.5, that amateurs of my generation salivated over but could never afford. 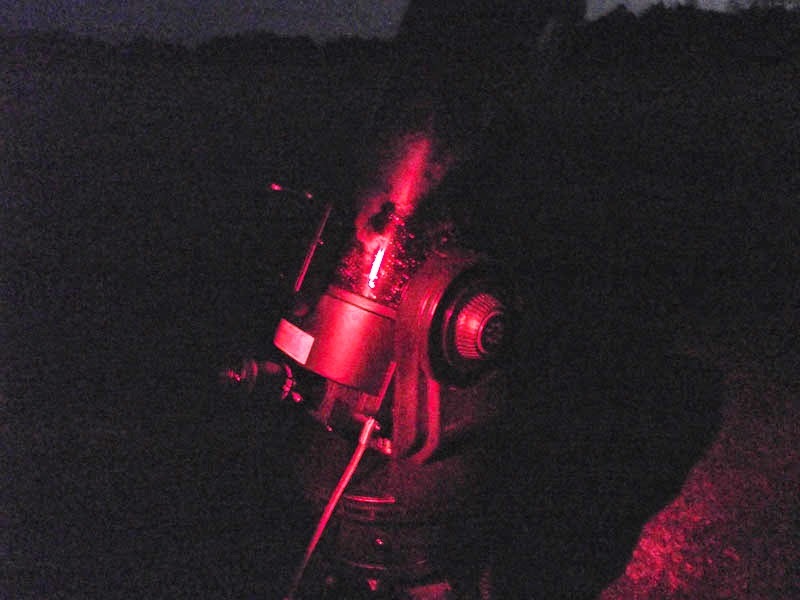 The Meade ETX90 wasn’t quite as pretty as the Questar. Well, it wasn’t nearly as pretty, honestly, but it damned sure was more affordable at a price of 500 bucks. While most of us were mightily impressed by the price of Meade’s “Questar” and by the company’s big full-color ads for the little thing, we were also skeptical the company could deliver anything close to the Q3.5 for less than 1/6th the price. Unk was as wary as anybody else, but he sure got fired up when one of his mates bought a 90. 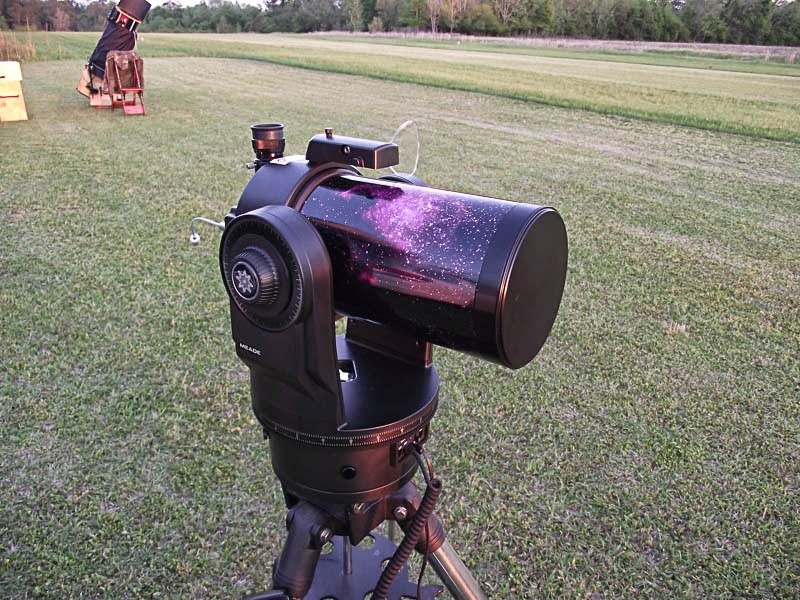 Purty soon, we weren't just planning to test the little feller, but to do a shootout between the ETX and another Possum Swamp Astronomical Society member’s Questar 3.5. That showdown got Unk in a heap of trouble with Questar fans. You see, I told the truth about it. Try as we might, we couldn’t see a lick of difference between the images in the Questar 3.5 and those in the ETX. On any object we tried, they were similarly excellent within the bounds of what’s possible for a 3.5-inch telescope. The mounts were another story. While the Q’s little fork is not perfect, not hardly, it was light-years ahead of Meade’s all-plastic-all-the-time build quality. That observation did not redeem me in the minds of the Questar fanatics, however; I had committed heresy. 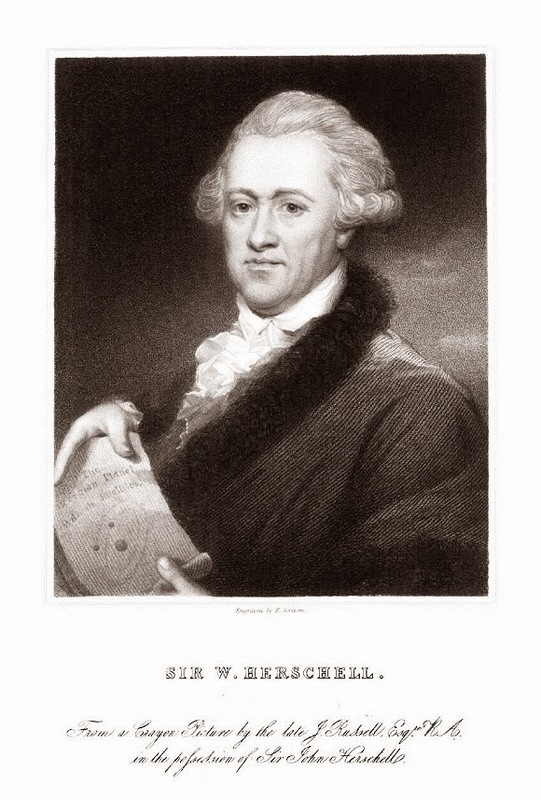 Meade did more than just challenge the Questar—for optical prowess, anyway. They started a small revolution. Purty soon, it seemed like everybody owned an ETX, and a cottage industry of aftermarket accessories sprang up to support the scope. 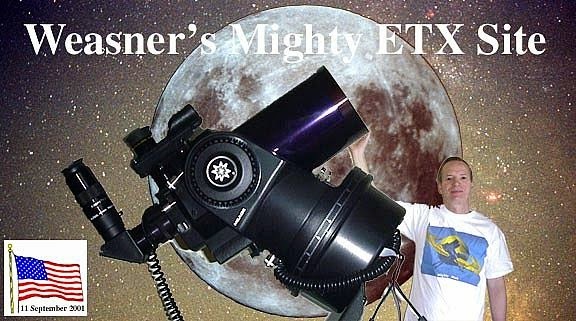 There were Yahoogroups and websites aplenty, too, including a legendary one, (Mike) Weasner’s Mighty ETX Site, which went on the air not long after the 90 came out and became the goto place for all things ETX. Meade was aware they had a hit on their hands and were not slow to capitalize on it. They soon upgraded the original 90, adding goto with the Autostar hand control, which made the LX200’s controller suddenly look old. And… They brought out more ETXes, the ETX105, a 4-inch, and the ETX 125, a five-inch. “And everybody lived happily ever after,” right? Sorta. 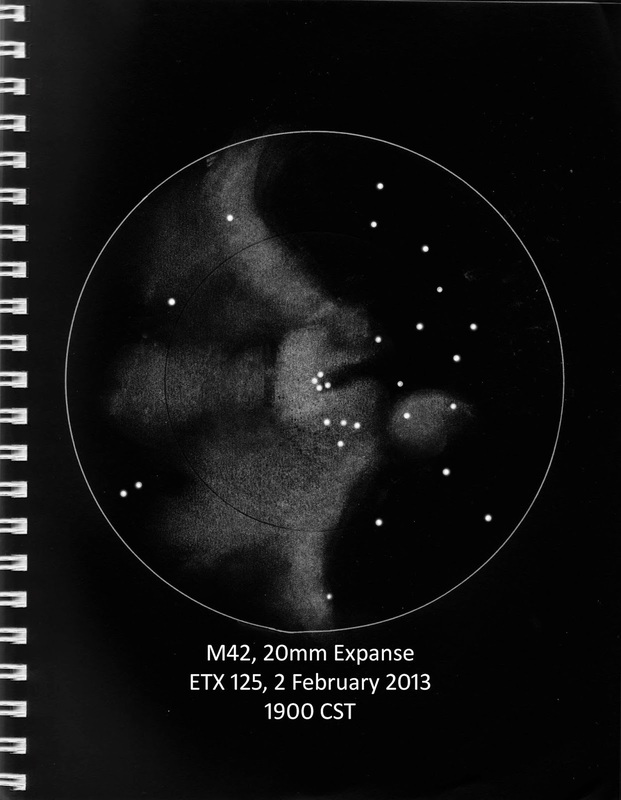 The ETX was not problem free, with most of the telescope’s difficulties being traceable to all that plastic and to computer bugs. Meade worked hard to get the ETX working right, however, while keeping the price down. The ETX just rolled on year after year, for well over a decade, till Meade’s fortunes began to decline in the years after the turn of the century. At first, it looked like the ETX would be the winner during Meade’s transition period. ETX production moved to China and, despite a few initial hiccups, the telescope was soon arguably better than it had been in the beginning. The “Chinese” ETX125PE, for example, unlike earlier models, has a metal fork (plastic covered). Also, after years of expanding the Autostar’s features and squashing its bugs, there was little that needed improving there. Then, last year, even before Meade went belly-up and was bought by the Chinese firm Ningbo Sunny, the hammer fell on my favorite Meade telescopes. The 105 had been gone for a while—it was always the odd man out in the lineup—and that was understandable, I reckon. What wasn’t so understandable was that the still popular 90 and the 125 were discontinued as well. Oh, there were still ETXes, but they were not real ETXes. For a while, Meade classified its new LightSwitch (LS) telescopes as “ETXes,” but they were SCTs, had little in common with the ETX, and soon became a separate product line. When I heard the ETX90 was going to be kept on, I initially rejoiced. Until I got a look at it in Meade’s magazine ads and read Gary Seronik’s review of the scope in the June 2013 Sky and Telescope. His verdict was that while the mount seemed more or less on a par with the old ETX mounts, albeit with less consistent goto accuracy, the optics were not. The example he tested had “soft,” undercorrected optics. Poor optics in an ETX was a surprise, since one thing the ETX, and especially the ETX 90, always had going for it was outstanding optical quality. That may not matter, anyway. The days of the last of the ETX tribe may be numbered, too. It’s not clear in which direction the new owners intend to take Meade, but both of these latter day ETXes are often back-ordered, and much of what Meade was showing at the 2014 NEAF astronomy gear extravaganza consisted of, I understand, small refractors and Newtonian reflectors like the ones its new parent, Ningbo Sunny, sells. Anyhoo, there’s a distinct feel of things winding down in the ETX Universe, and I can’t help feeling blue about it. The premier ETX Yahoogroup once boasted message traffic of a dozen—or more—posts every fraking day. Now, if you see one post a month it is doing good. Saddest thing of all? The end of The Mighty ETX Site. Mike’s website is still online; it’s just not being updated anymore. The reason, I’m told, is that when he and his wife retired to the clear, dark skies of the hinterlands, Internet became slow and expensive for them. 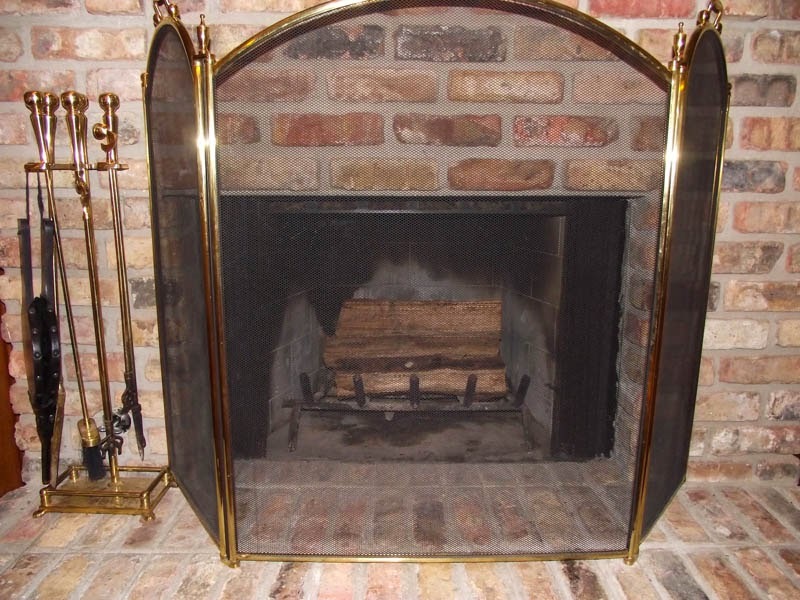 It became impossible for Mr. Weasner to keep updating the site as he had for the last 17 years. I understand Mike’s need to ring down the curtain on his wonderful (and helpful) website, but I’ll still miss it. All I can say is, “Thanks for all the years of ETX fun.” At the end there really wasn’t much going on at Mighty ETX, anyway. There’s just not much call for a website for ETX junkies now, I am sorry to say. Set the WABAC Machine for the fall of 2005. Old Unk, not quite so old then, was on the horns of a dadgum dilemma. While I wasn’t as old as I am now, I was every bit as lazy. And the weather that year had been dern near as bad as it’s been this year. I had got to the point where I was reluctant to haul even the C8/CG5 out to the club dark site for just another skunking. I needed a portable rig, but one with some fraking reach in case the sky suddenly improved on them “iffy” nights. The obvious choice seemed to be Celestron’s NexStar 5, the time-honored C5 on the NexStar goto mount. I knew the NS5 had excellent optics, since a buddy in the Possum Swamp Astronomical Society, my late friend George Byron, had one and I’d tested it extensively. Another plus was that I already knew how to work the NexStar hand control. A NexStar 5 it would be, then. Or so I thought. 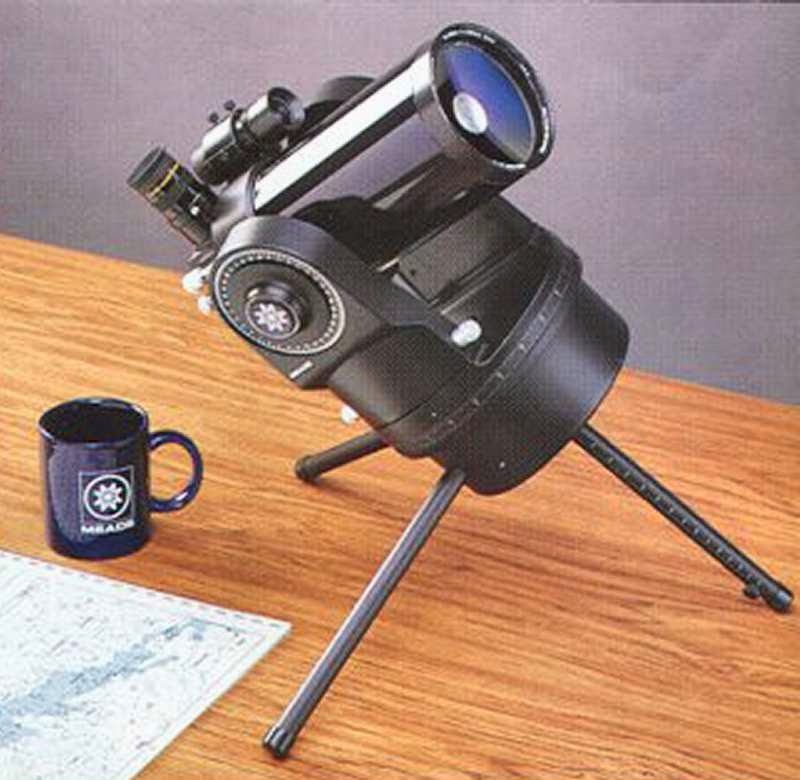 When I tried to buy one, I found out the C5 was on one of its periodic hiatuses from Celestron’s product line. Hokay. What was similar? There was the ETX125. I looked a little askance at the scope’s build quality thanks to the one example of the “big” ETX I’d tested. However, those in the know informed me the scope had been improved to the tune of, as mentioned earlier, a metal fork. Further, the just-released incarnation of the ETX, the “PE,” had kicked things up another notch or two with plenty of new features. There didn't seem to be an alternative that would suit me—a convenient, portable goto rig with an aperture of 5-inches—so I got my courage up and gave my credit card number to Scopetronix, a now-gone but much-liked little Florida dealer. 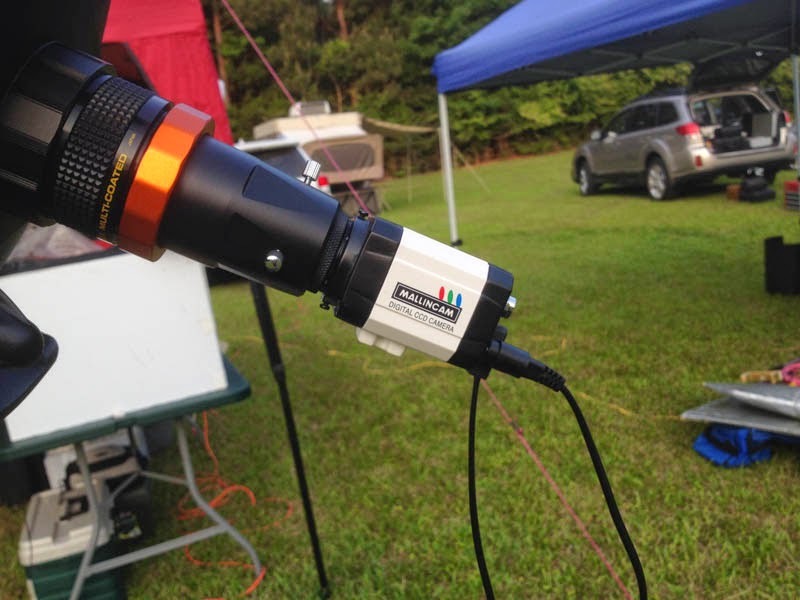 Scopetronix’s owner, Jordan Blessing, had made a name for himself selling fixes and enhancements to the owners of the ETX and other Meade scopes, and had gone on to become a Meade dealer, the closest one to me. When the big box bearing my ETX arrived at the Old Manse, I was both excited and a little appalled. A new scope, any new scope, big or small, is exciting. The “appalled” part? That tube. I knew from the advertising pictures that the PE’s tube was tarted-up with a silkscreen deep sky image—kinda like the Moon map trope of the Questar OTA. I didn’t expect it to be quite as gaudy as my ETX125’s pink and red vista of the North America Nebula, though. After a little while, however, I decided I actually liked the 125’s looks OK. Like cats, all telescopes are black in the dark, after all, and the OTA sure gave her personality. Personality was something my ETX, whom I quickly named “Charity Hope Valentine” after Broadway’s hapless heroine, wasn’t short on. She’s always had her neurotic quirks, that’s for sure. Some nights her goto is great, sometimes not so great (which means I just need to do a procedure Meade calls “drive training). Sometimes she makes such weird noises when slewing that I think she is about to collapse in a heap. But she never has; she always comes through in the end. What was it like using Charity in the field? Turned out she was just what I needed for those semi-punk nights when I want to get going in a hurry and might have to shut down in a hurry, too. The “PE” in ETX125PE refers to a couple of enhancements that make the scope almost like a GPS without a GPS. Getting her goto aligned is almost identical to aligning my NexStar 11 GPS: quick and easy, that is. The scope does not have a GPS, but it does have battery-backed memory that holds-in date and time. Unless I move to a substantially different observing location, I don’t have to enter any data into the Autostar; just turn on the scope and mash the Autostar’s “0” key to begin alignment. Charity then levels, finds north, and slews to the first of two alignment stars. I center the stars in her red dot finder (which houses the PE “LNT,” “north and level” circuitry and the battery that keeps the clock running) and I am done. Packing up when the thunder begins to boom and the lightning flashes? I can have Missy off her tripod and in the truck in five minutes or so. Which brings us to a Saturday night a few weeks back, which wasn’t forecast to be any kind of iffy. The weatherman said “dead clear” and “cool, not cold.” So why was Miss Valentine involved? With the Deep South Regional Star Gaze Spring Scrimmage beginning the following Thursday, I had all my gear for the star party—C8, VX mount, etc., etc.—marshaled in the front parlor, and laid-out just so so I wouldn’t forget anything. 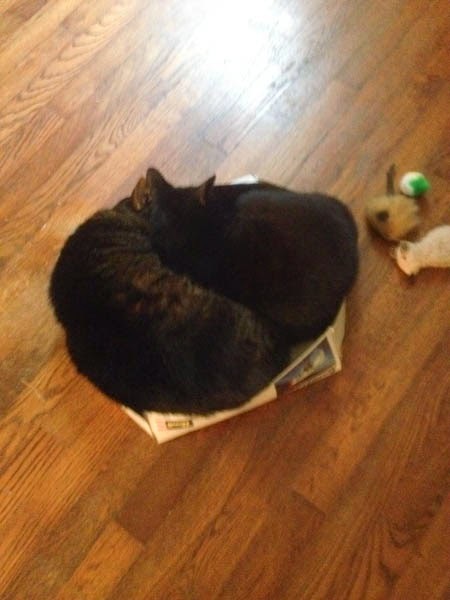 I didn’t want to disturb it. 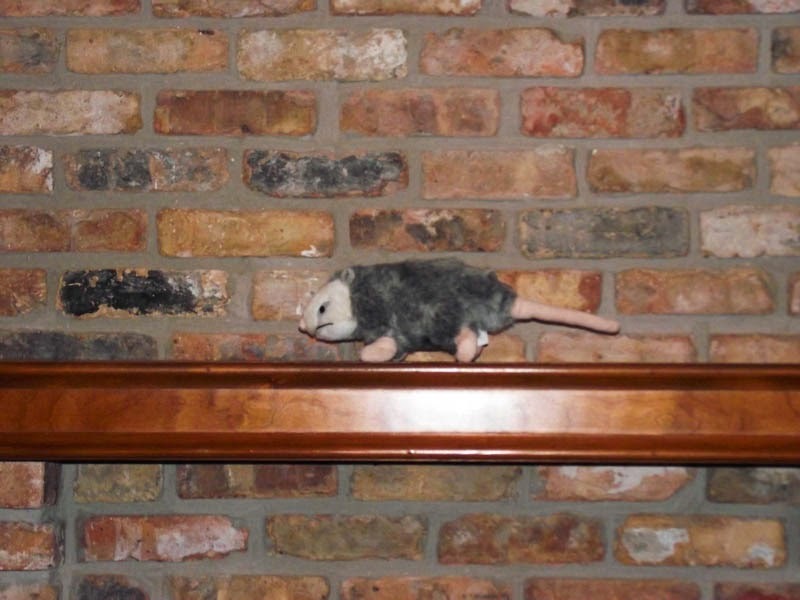 Further, if you’ve been reading the Little Old Blog from Possum Swamp attentively, you know me and Miss D. are preparing to move to the suburbs. All the packing and throwing away and other work involved in buying a new home had Unk plumb tuckered. Sweet Charity it would be. Sure was different from the run I talked about in “Two-and-a-half Years after the Honeymoon.” On that evening, I drove through a thunderstorm on the way to the PSAS dark site. Not this time. The weather was beautiful and obviously intended to stay that way. I was surprised only two other PSAS stalwarts joined me on such an obviously superior night. Where was everybody else? I have no idea. Must have been a cotton-picking Mountain Monsters marathon on the cable TV. Anyhoo, I was happy to have some company, anyway, and got Miss on her tripod in two shakes. It wasn’t yet dark when I fired up my little girlfriend. I wanted to check her LNT battery. Mashed the Mode button and had a look at date and time. Spot on. Which was surprising, since it had been over a year since I’d last used her, since the evening after Unk’s Awful Tooth adventure in February of 2013. The button cell that powers the LNT generally lasts no more than 6 – 8 months, but this one was still OK more than a year later. Maybe because the last time I replaced it I used a Duracell instead of a no-name battery from Big Lots. I figgered I should train the drives while I waited for darkness. Charity’s goto would probably have been OK without out doing that, but I had time, so why not? I focused on a telephone pole a couple of hundred meters away, started the procedure, and re-centered the pole in azimuth and altitude after the Autostar slewed off it. I don’t know if it was the drive training or if Charity was just awful hungry for starlight, but this was one of those times when my girl could do no wrong. She performed her little alignment dance like a trouper and headed for Sirius, which was close to the red dot when she stopped. I centered it, centered Capella, the second alignment star she chose, and we were off to the races. From then on, every single object I asked for was somewhere in the field of a 20mm eyepiece (about 100x). From horizon to horizon. After a quick look at Jupiter, which was nice at 200x despite somewhat punk seeing, Charity and I started a four hour deep sky tour. What did we look at? 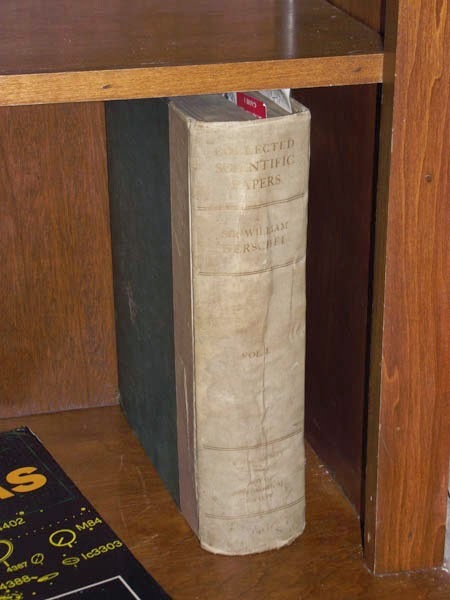 I thought it would be fun to revisit some of the objects from the Two-and-a-half Years blog, the ones that weren’t too low in April—the observing for the old article was done in May. M42 was getting awful low, and I figured this would be my last view of the marvel for this season. Looked good, mighty good. It always does in any scope, but Charity seems to sometimes pull out more than her share of dark lane detail. M13: Six years ago, I opined the Great Glob wasn’t much different in Charity than it is in a C8, and I felt the same on this night. Good amount of resolution around the edges and a grainy core despite the cluster still being way down in the Possum Swamp light dome. M5 looked terrific, even better than it had in 2006. I’m always been surprised by how well Charity does with globs. I’d previously have thought you’d need at least a 6-inch to get the kind of resolution the ETX delivers. Her sharp optics bring back hordes of itty-bitty stars. M82. I didn’t see the supernova, which is down to magnitude 14+ judging by the view I had of it in my friend Taras’ 15-inch Dob, but I did see plenty of detail in the galaxy. At 150x, the criss-crossing dark lanes were amazing. M3 and M53, the spring globulars, were both nice. M3, in particular, gave up a bunch of stars despite being just outside the light polluted region in the east. It’s no competition for M13 or M5, of course, but is still nice. M53 was OK, showing a few stars here and there, but it really needs more aperture. M67, the aged open cluster in Cancer is one of my faves. It’s reasonably rich and has some character, being composed of rather subdued yellowish stars. Charity showed plenty of ‘em, since, unlike in ‘06, I remembered to catch it before it got too low in the west. M65 and M66 were subdued on the Two-and-a-half Years run. Not tonight. Not only were they bright in the 20mm eyepiece (an Orion Expanse) as they culminated, they showed plenty of detail and were easy to distinguish from each other. I even got a look at dimmer and larger NGC 3628, the third member of the Leo Trio. M105 and company. I love this little galaxy group in Leo’s “belly” area. The ETX usually shows two of the three, but this time I was able to pick out all three members. Quite a catch for an humble five-inch. Omega Centauri was probably the biggest surprise. 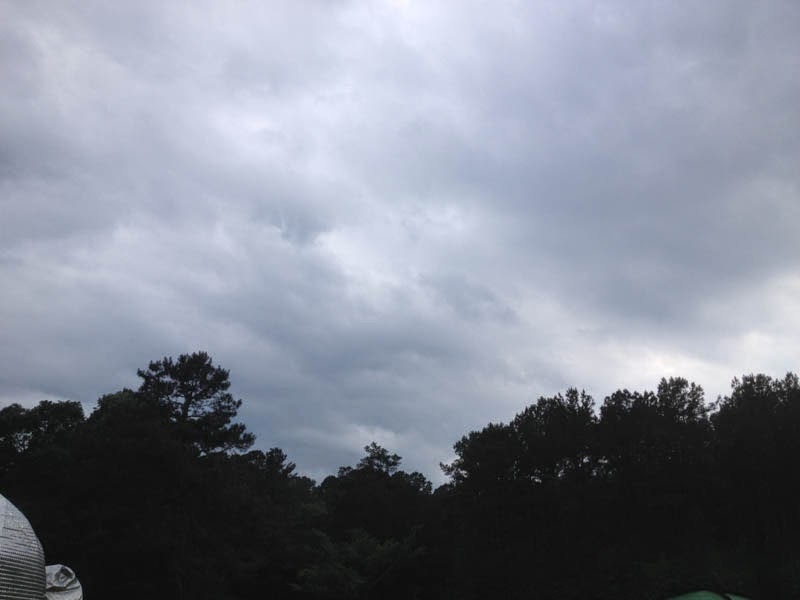 It was just above the treetops, but actually began to resolve in the ETX despite a sky background that was bright gray. M104, The Sombrero Galaxy is another favorite of mine, and Missy did right well. The galaxy is always smaller than I remember it being and a little tougher detail-wise than you’d think a bright Messier would be. Charity showed the dust lane nevertheless. Barely. M87, the monster elliptical in Virgo, Virgo A, wasn’t just visible as a bright, round spot; it had company. Nearby NGC 4476 was easy and NGC 4478 peeped in occasionally. The Ghost of Jupiter, NGC 3242, was one of the hits of the evening; it was big, bold, and slightly bluish in the eyepiece, floating in a rich field of southern stars. It even showed hints of internal detail at high power. Wished I’d brought along a cotton picking OIII filter. The above weren’t all Charity and I essayed. The sky held in, and my girl was champing at the bit, picking off deep sky marvels like a kid gobbling penny candy. Centaurus A, the disturbed galaxy near Omega Centauri, was amazingly bright. The Eskimo Nebula over in Gemini showed some detail at 300X when the seeing cooperated. M97, the Owl Nebula, was easy, and I almost imagined I could see the eyes. Finally, though, after we’d passed the “forty objects” number or thereabouts, the night began to grow old, Unk’s bones began to grow cold, and the heavy dew got me to thinking about Chaos Manor South’s warm den. A good look at Mars, who, at 300x, showed a tiny polar cap, plenty of dark detail, and a limb brightening, and I was done. Time to get Charity back in her case (a nice aluminum job I got from OPT). She was packed and in the 4Runner in less than five minutes. Setting in front of the cable TV, sipping a warming draught of the Yell, I ruminated. Sweet Charity had done spectacularly well, muchachos. So good I almost wanted to promise myself I’d use her more frequently. Experience, however, says that will not happen. I usually want more telescopic horsepower. There will always be Charity Hope Valentine nights, though—and they will likely increase in number as Unk becomes ever more decrepit—and on those evenings I will have my sweet little ETX to turn to. What have I seen of the deep sky so far this year? Nuttin’ honey. Well, that ain’t strictly true, muchachos, but almost. 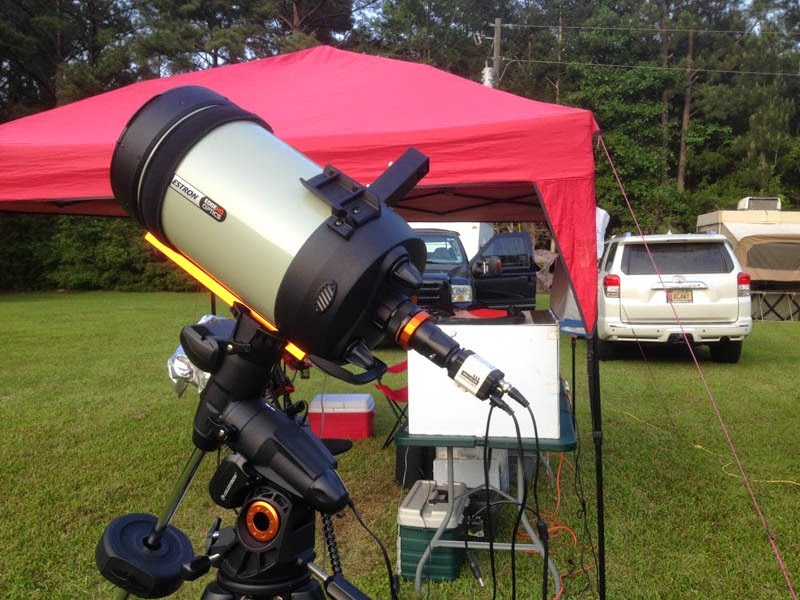 I’ve had a few OK evenings at the Possum Swamp Astronomical Society Dark Site, but not many. Me and Miss Dorothy’s January pilgrimage to the Chiefland Astronomy Village was a complete skunk-out. First time in five years I didn't even unload the scope. The weather was so nasty the week of the CAV Spring Picnic in March that we cancelled out. First time ever for that. So, I was hoping, hoping mightily, I’d get some hours at the 2014 Deep South Regional Star Gaze Spring Scrimmage. 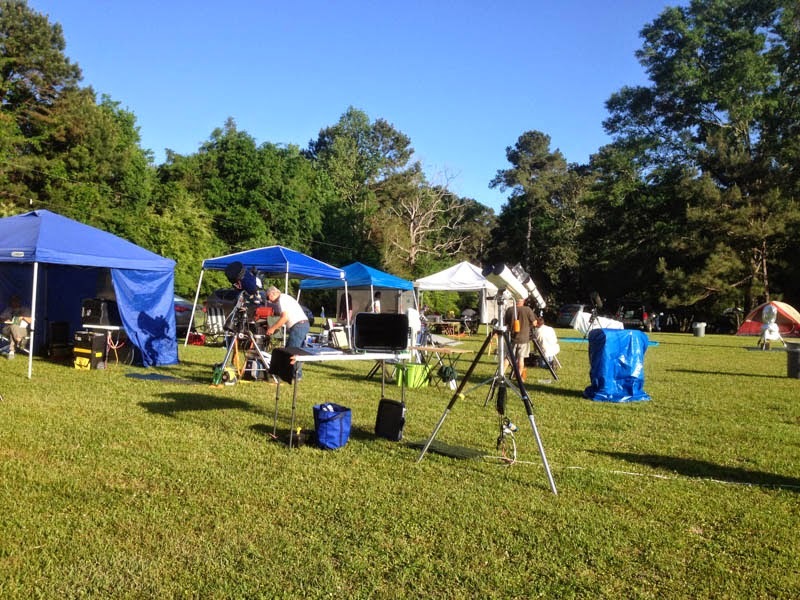 The no-frills springtime edition of our local star party is held in the same place as the main event, the Feliciana Retreat Center near Norwood Louisiana in the eastern part of the state. It’s a nice place run by the Presbyterian Church, and features a motel-like lodge with small rooms and a beautiful dining hall. It’s also got an expansive field for observing—when the weather permits. Let’s face it, deep sky observing is always dicey down south in mid-late spring. You can get nice nights, but they are not plentiful, and even on good evenings it’s going to be damp and sometimes hazy. What did the weatherman prognosticate for this year’s Scrimmage? A mixed bag, with Thursday the 24th and Saturday the 26th looking iffy. Friday? I thought I might get some time that evening. Which would be a good thing. For the last year and a half, I’ve been trying to put the bow on the package that is the Herschel Project. I wanted to go back and image about 200 objects. Re-image them, actually. I had video footage of all of ‘em, but that video was done with my old Stellacam II camera, and looked mighty putrid. I wanted to redo those DSOs, mostly galaxies, with the Mallincam Xtreme. From the official end of the H-Project’s principal observing in 2012 till now I’d only redone about 50 of these aitches (mostly because of poor weather the past two years). That left 150 to go, and while I sure didn't expect to get all of ‘em, I wanted to get a lot of ‘em at Feliciana. I also had a secondary goal, testing a brand new Mallincam. If you watch the video astronomy scene, you know Mr. Rock has released a flurry of new cameras. I was mightily impressed by the Junior Pro, since it went a long way toward busting the price barrier that has kept some folks out of deep sky video. Then I heard Mr. M. was coming out with an even cheaper—much cheaper—camera, the Micro-EX at a price of 99 bucks ($169.99 with an AC power supply and some other accessories you are gonna want). The question in my formerly military mind? Quite a few 1/3rd inch chip deep sky video cameras have come to market recently, and I’ve looked askance at their small sensors (the Xtreme and Junior Pro and most of the other M-cams have ½-inch CCDs). Could a cheap camera with a small chip satisfy? I intended to find out. 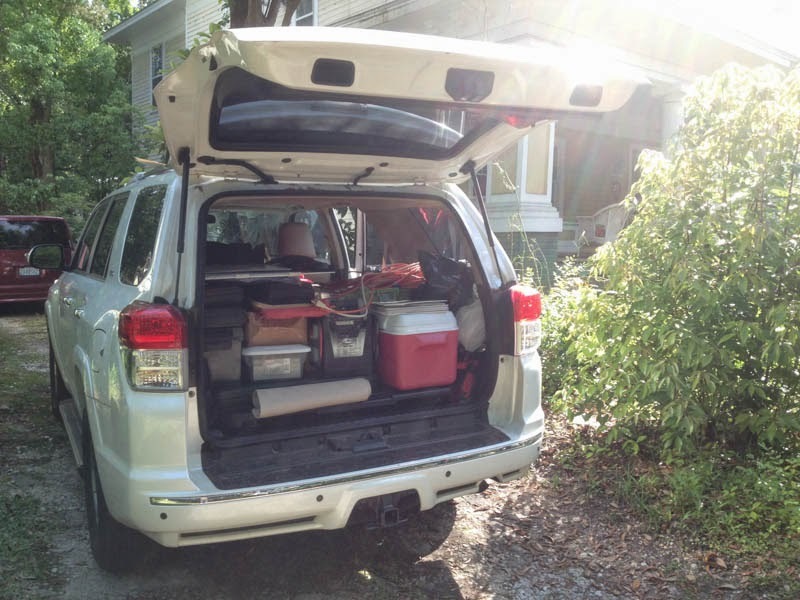 As y’all know, I HATE packing on star party morning, so, as has been my practice for a while, I loaded Miss Van Pelt, our 4Runner, the night before, Wednesday evening 23 April. In the couple of years I’ve had the Toyota, I’ve managed to get the packing thing down to an art, so it only took about half an hour to get the Edge 800, Mrs. Emma Peel, her VX mount, and all the tons of other gear I carry to a star gaze squared away. What then? I took a look at the weather forecasts on the computer and on the cable TV. The results were the same as they had been. Thursday didn't look too good. Friday was better. Saturday looked to be down the tubes in advance of severe weather coming in early the next week. At least the outlook was better than it had been for last year’s Scrimmage, which came at the end of May. Being in April helps. Get deep into May and those Gulf Coast storms start rockin’. Nevertheless, I had one good night last year and couldn’t help but think I’d get at least one at the 2014 Scrimmage. Weather agonized over, I settled in with a little Kolorado Kool-aid to watch my fave silly reality show of the moment, Mountain Monsters. But only for a while. I had sworn I’d go to bed early so I’d be rested enough to do a full night of observing after the drive and gear set up. I headed upstairs shortly after nine, but wouldn’t you know it? I was awake by two. Star party crazy Unk = little kid on Christmas Eve. I finally got back to sleep about four thirty, just an hour before wakeup time. Oh fraking well. I’d decided to drive straight through to Feliciana so I’d arrive just as the curtain went up on the star party at ten in the morning. So, no Mickey D’s fried chicken biscuit for moi. I grabbed a leftover slice of pepperoni pizza (from the pizza party I gave my astronomy students on their last night of class), gobbled that, tossed down a cuppa Joe, and was out the door. Cruising down I-10 toward I-12 and I-55, I was feeling purty good. Would have felt real good if I hadn’t been all by myself. Miss Dorothy was in DC visiting daughter Beth. The spring edition of “Deep South” is a no frills affair—no speakers, prizes, or vendors—so, like last year, it seemed the perfect time for Dorothy to head north. This was my second Spring Scrimmage, last year's being my first. Previously, dadgum work had prevented me from doing much spring star partying. This retirement stuff is good, y’all, real good, though it took me a year to adjust to it (more or less). Something else would've helped my attitude in addition to the presence of my lovely wife. I’d have been in a better mood if it weren't for all the fog. It was thick enough as I crossed the Mississippi line that I switched on Miss Van P’s fog lamps. If nothing else, I figgered fog would shut us down by midnight. To help take my mind off the weather, I was listening to an audio book of one of my favorite Stephen King novels, The Girl Who Loved Tom Gordon. Poor Trish was well and truly lost and walking toward the wilds of New Hampshire’s “chimney” by the time I pulled onto the grounds of the FRC. One thing was apparent as I drove onto the observing field: the Feliciana Retreat Center’s new manager was doing the “steady as she goes” thing. The grounds were immaculate and the huge observing field freshly mown. After saying hello to my fellow early arrivals, DSRSG Manager Barry Simon and long time Deep Southers Ron and Walt, it was time to get Mrs. Peel and all her support gear unpacked. 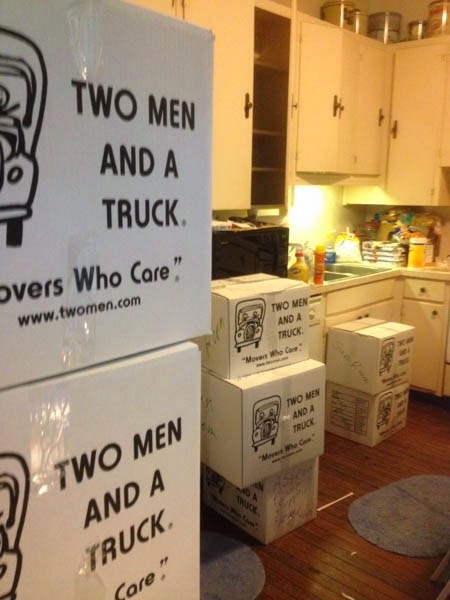 Unloading the truck was not as painful as it was last year. The temperature was comfortably warm (my old bones like warm), but still mild. Maybe in the mid 70s. I set up the SCT, pitched the tailgating canopy, and unloaded my multitudinous gear cases, all without breaking a sweat. Last step was hooking up to the AC power panel with my 100-foot extension cord, and then it was time to motor up to the Lodge. How was the Lodge? It was much the same as always, and that is a good thing. 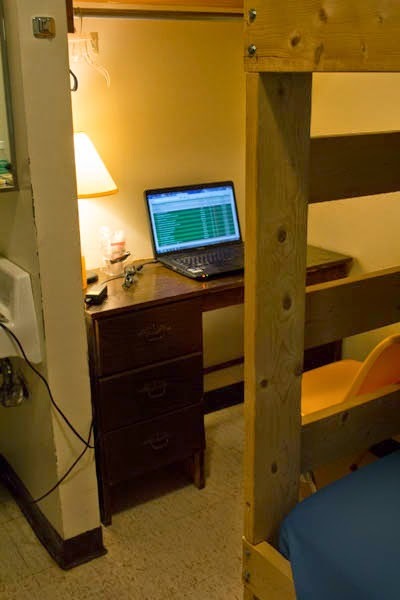 The rooms are small and Spartan, even compared to the Chiefland Days Inn, but they are sufficient and mucho bettero than a chickie cabin or a tent. I did note the room I finally got (Walt had mistakenly set up in my room, so I took his), “West Nine,” didn't seem as well maintained as it could have been. 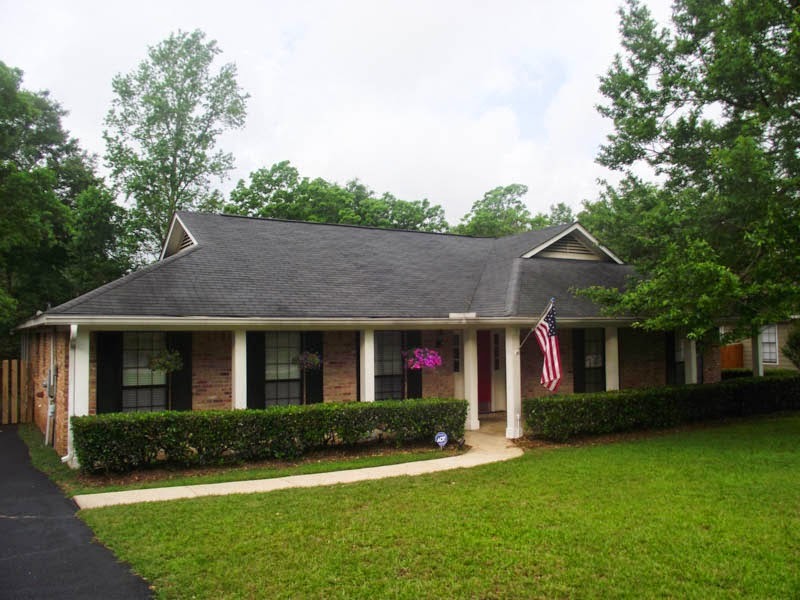 It was clean, but the plumbing—each room has a bathroom—seemed a little creaky. I am sure the new manager will take care of such things. She seems to be a take-charge-and-move-out kind of person. Turned on the laptop and checked the FRC’s Wi-Fi Internet. While not perfect—satellite Internet never is—it worked, which is more than it did at the 2013 Scrimmage. Being able to check the weather is a help, and being able to look at the Cloudy Nights BBS and Facebook can be a godsend on nights when the weather turns punk. I moseyed back out to the field to finish a few other setup tasks, and when that was done, it was lunchtime. How was the food? Not so hotsky. Not on Thursday. There was a kids’ group spending the day at the FRC, and I reckon the staff decided to do kid-centric meals. The burgers at lunch were OK, but the french-fries, which had the consistency of stale Cheetos, had obviously stayed under the heat lamp way too long. The chicken strips we had for supper were similarly execrable. Saving grace? The salad bar, which was great as always. While the food was edible, them chicken nuggets, especially, weren't within a country mile of the Center’s usual Thursday fare, pot roast and mashed taters. My lack of sleep Wednesday night was taking a toll after lunch, so I lay down in the room, perusing the latest issue of Sky and Telescope (June 2014; Unk has an article in that issue). After a while, I was able to drift off for a nap that lasted almost until supper and the coming of those shoe-leather chicken planks. What else is there to say about Thursday? Not much, ya’ll. I spent some hours on the field after supper, hanging with my fellow star partiers (we had at least tripled our number by evening) and, in particular, admiring their scopes and mounts. Most popular rig this spring? 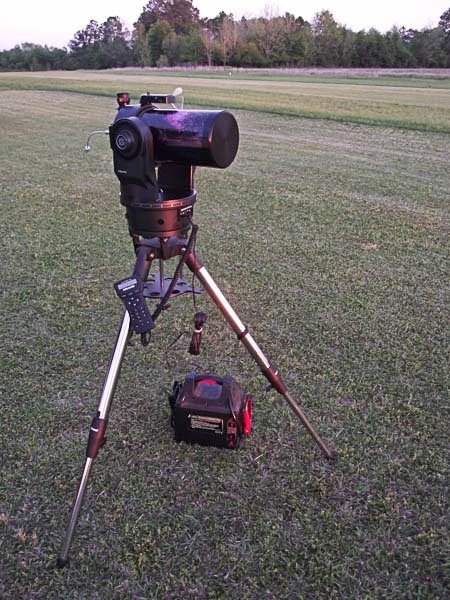 The Celestron VX GEM; there were three of ‘em on the field including Unk’s mount. At the tail end of afternoon, the sky was, surprisingly, looking good, far better than I expected. Until, shortly before sunset, we began noticing clouds about ten degrees above the western horizon. Over the course of an hour, they multiplied and were soon covering the whole freaking sky. I had at least hoped to get Mrs. Peel roughly polar aligned, but couldn’t even do that. Polaris peeped in and out for a while, just to tease, but by full dark was gone for good. I stuck it out until 10:30, when it became obvious nothing was changing anytime soon. Back at the room, I quaffed a few refreshing sarsaparillas, sat back, and watched Star Wars Clone Wars Season One on the laptop’s DVD player between looks at Wunderground and Weather.com. The weather services were still forecasting Friday evening to be clear, but they’d said the same for Thursday until a few hours before the clouds moved in. No point in fuming. On the Gulf Coast in the spring, you just have to roll with the punches the weather gods throw at you. When I slowly, ever so slowly, rolled out of bed at 7 a.m. Friday morning, I was almost afraid to look outside. I needn't have been; there’d obviously been no rain. If there had been fog, it was gone now. The Sun was shining, the birds were a-chirping, and examining the gear out on the field before breakfast revealed the dew had been heavy but not as heavy as it can be down here this time of year. Only bring-down Friday morning? Unk screwed up. In line for breakfast, I got my grits and I got my huge biscuit and I got my eggs. But…when the little girl doing the serving asked if I’d like to try the turkey “bacon” and sausage, I said “yes.” The turkey patty was right good in a biscuit slathered with grape jelly, but that ersatz bacon? It tasted like something, I reckon, but NOT bacon. Yeah, it’s good to veer to the healthy side once in a while, but don’t drive that into the ground and break it off, not when it comes to BACON. I had a Sky and Telescope assignment to work on, so I spent a few hours with MS Word, and when I finally came up for air it was, amazingly, getting on toward supper. That was red beans and rice, pork loin, and cornbread, and it was all good, y'all, real good, right back up to the FRC’s usual standards. On the field as sundown approached, it appeared we were going to break a record. There were upwards of 25 observers present, more than ever for a Spring Scrimmage, which was beginning to look like a real star party. Even better, there was no doubt the clear skies were going to hold. It was not crisp and cool, but it was cool enough and not too humid. Some haze was revealed when I covered the Sun with my palm, but not as much as there might have been. As soon as Polaris showed up, I set about getting roughly polar aligned (sight the North Star in the hollow polar bore of the VX). Last star done, I was standing there fat, dumb, and happy till I realized, “Rod, you dummy, you gotta do the AllStar.” Since I’d be using the Mallincam, I needed a closer polar alignment than the rough one I’d done with Polaris. Looking south, I spied Alphard, Alpha Hydrae, due south and not too high, which is the perfect prescription for an AllStar polar alignment star. I sent Mrs. Peel to Alphard and started the AllStar alignment. The VX slewed away from the star, and told me to re-center it with the direction buttons. I did that using my joystick, and the mount moved away from Alphard one last time, cautioning me not to use the direction buttons, but to line up the star with the altitude and azimuth adjusters instead, which I did. When I was finished, I had a look at the polar alignment accuracy as displayed by the hand control (my virtual hand control in NexRemote). It claimed I was dead-on with no alignment error at all. None. I doubted that, but I was close enough to the pole that no star trailing was noted in unguided 30-second images with the small-chip Mallincam Xtreme. Actually, I wasn’t quite done. 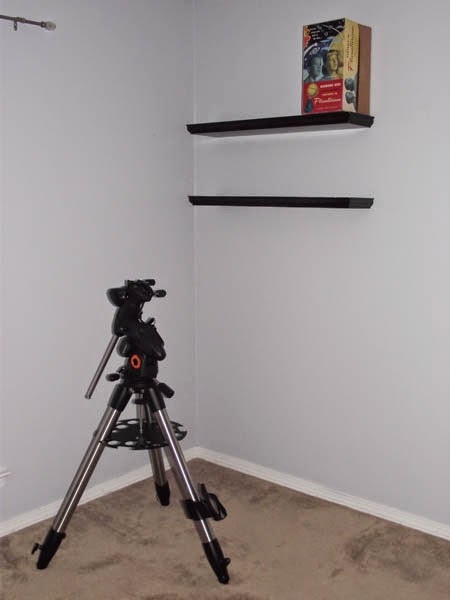 I’d moved the mount a fair distance to polar align, and that would have thrown my gotos off. So, I essayed a fresh 2 + 4 goto alignment before declaring myself ready to hit the sky. Before I forget to mention it, all alignments were done by looking at the stars on the Mallincam’s monitor (my little portable DVD player). You can have the Xtreme throw up a set of crosshairs, which makes alignment a breeze. I didn't use NexRemote’s virtual hand control much, but when I did, it reminded me how much better I like Celestron’s old HC layout than the new one on the "Plus" HCs. The old hand controls have dedicated M and NGC buttons, which I love. I didn't use the virtual HC much? How in Hades did I goto my targets, then? I lit off the SkyTools 3 software on the laptop, loaded the Herschel Project list into the program’s RealTime tab, connected ST3 to the mount via NexRemote’s Virtual Port function, and from then on went to list objects by clicking on them and mashing ST3’s “slew to” button. First target of the evening was Comet Panstarrs, which was on SkyTools’ “Current Comets” list. The new Comet Panstarrs, C/2012 K1, in Ursa Major not far from the “tail” star of the dipper, Alkaid. It was surprisingly prominent in the Xtreme, and I estimated its magnitude somewhere around 9. Looked slightly greenish, and sported both an ion and a dust tail in the live video. Cool, but I couldn’t spend too much time with the little visitor. I had a slew of Herschels to chase. And so it began. I had roughly 150 objects to image, most of them were in Virgo, and the Maiden was well up over the trees in the east, so that’s where I started. What was particularly fine on this night? I did some “purties” just before shutdown, but other than that, the winner was M100. The Coma galaxy was not actually a list object; instead, I was after a fairly nondescript little sprite, NGC 4328, a lenticular. M100 was right next to it though, exploding onto my screen with a welter of spiral arms. And so it went. I’d click on the nextun in the list, slew to it, record 30-seconds of video images and audio notes with my Orion StarShoot DVR recorder, and move on. Before long, it seemed, I was done with Virgo and Coma Berenices. I guzzled a Monster Energy Drink, took a tour around the field, visited the little astronomers’ room, and sat at the PC to figger out where to go next. Quite a few to do in Crater. Got ‘em. Plenty in Corvus. Done. Coma? Finis. When I stood up and stretched the next time, it was two and there were no more Herschels available. Switching to the non-RealTime list display, which shows all objects whether they are over the horizon or not, I was amazed to see there were only seven fuzzies to go, to re-image. I thought I might be able to snag them in Chiefland next month if’n the weather goobers were correct and I didn't see nothing Saturday night. Despite 2 a.m. having come and gone, the Monster ensured I was still raring to go. Go where? To the cool stuff rising in the east. Over the next hour, I did a tour of the best and brightest: M13, M57, M10, M12, M16, M17, M8, M20, and more. What did I favor? All looked incredible on my monitor, but the Trifid at 28-seconds (video below) stole my heart. Not only were the “petals” and dark lanes of the main nebula very distinct, the blue reflection nebulosity adjacent was as good as I have ever seen it with the Xtreme. As three in the cotton-picking a.m. approached, two things became evident: the Monster was beginning to wear off, and the sky was degrading. Oh, I could have had another energy drink, but that would likely have left me trembling like a dadgum Chihuahua. And even if I’d banished my weariness, it appeared the sky done with me for the evening. In addition to clouds in the southwest, a general haziness was creeping in. I hit the Big Switch and walked the ¼ mile back to the Lodge. There, I browsed Cloudy Nights for a little—a very little—while. Watched one more episode of Clone Wars, wet my whistle, and said goodnight. It was now four in the freaking a.m. I had retrieved some Quaker Oats oatmeal bars from the 4Runner before I left the field, since I was purty sure I wouldn’t be up in time for no breakfast. Saturday morning, I did indeed miss breakfast. Not that I slept as late as I’d have liked. I was awakened not long after eight by loud voices in the hall and what sounded like some goober rearranging furniture. At first, I was right put out. Then, I realized most of what I was hearing was actually the sounds of breakfast. Due to acoustics of the place, the noise in the dining room was funneled right down the hall of the residence area. Oh, well. I got up, showered, had a cup or three of Java, and was soon feeling OK. Lunch more than made up for my missed breakfast. The barbeque chicken was good, but what was outstanding was the baked potato salad. What’s that? Make potato salad, but use sour cream in addition to mayo. Oh, and add bacon. I had the best intentions of working on my article a little, and I did, but only a little. It was soon naptime thanks to all that cotton-picking food. That nap, a trip out to the field at mid-afternoon, and a little puttering around back at the Lodge brought up suppertime, the pièce de résistance, the FRC’s famous brisket. I must have had some sides to go with it, but frankly, y’all, all I can remember is that brisket. When I was finally done, I needed to walk it off, so out to the field I went, and that was where I stayed till darkness. Last night of the star party. As Joe Castiglione is wont to say, "And it all comes down to this." The big question was “What will the sky do?” The answer in most peoples’ estimation was “not much,” obviously, since telescopes were being packed away and tailgating canopies were being taken down. While a few folks did skedaddle for home, unlike last year, when I was nearly the lone astronomer of Deep South Saturday evening, most stayed onsite. That was cool. I’d have some company if the skunk ape put in an appearance in the dark of night. Unlike my mates, I was convinced we’d get a little while Saturday night, and rather than tearing down Mrs. Peel, I merely switched cameras, to the new one, the Micro-EX. I figured just getting M3 in view would tell me a lot about Rock’s latest creation. Set up was fairly smooth. Hooking the camera up was, in fact, a no-brainer. I just used the same video cable and 12vdc cord I use with the Xtreme. The only thing different was the computer control cable, which has a different style connector than the one used with the Xtreme. On the plus side, the new computer cord plugs right into a USB port, no USB-serial converter needed. It was now full dark, so I powered up the camera and started its computer control program, which is decidedly different from the software used with other Mallincams. Good thing I’d played with it at home. 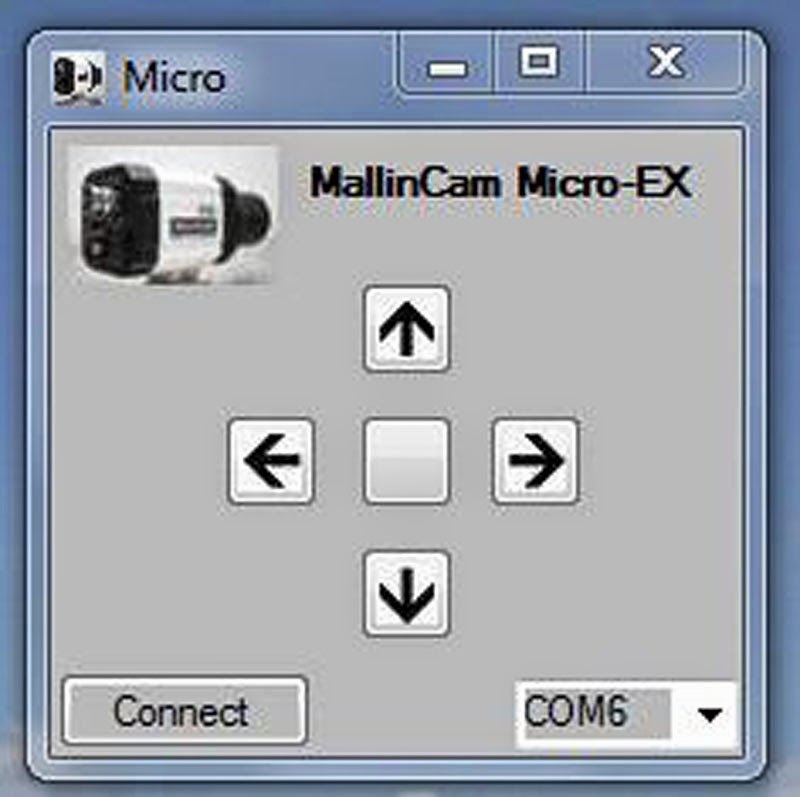 What it’s like is a computer version of the Mallincam wired remote. What you have onscreen is a set of virtual buttons, just like the ones on the back of the camera. You use the buttons to move a cursor and make changes in menus that appear on the video monitor, not the computer screen. First time I tried it, I was scratching my head for quite a while, so I was, again, glad I’d worked with it indoors. Got the camera’s settings, which are a little different from those on the other Mallin cameras, configurated and began alignment. The Micro doesn't do crosshairs, but it was easy enough to get the 2 + 4 stars centered on the screen with 2-second exposures. Any problems? Only one. Occasionally the video would go away. Unplugging and replugging the video cable fixed that the several times it happened over the course of the evening. Since it occurred with the telescope pointing nearly straight up, it was probably a connection problem—the cable would flex as the scope headed to the zenith. After the third occurrence, I plugged the video cord back in extra firmly, and it appeared the problem was banished. I will keep my eye on it howsomeever. Observations? I had to play around with the settings a bit to get a picture I liked—I had to run the gamma lower (brighter picture) than I would with the Xtreme—but I soon had an impressive view of M3. Well, impressive given the putrid conditions. Plenty, and I do mean plenty, of resolution despite the scope looking through haze. But M3 is bright. How about NGC 2158, the little cluster hard up against M35? It was not only there, but looking well-resolved at the Micro’s longest exposure, 17-seconds. The Eskimo Nebula was purty sweet, too. Nice and greenish blue (sometimes the whole sky background became green due to haze). When clouds covered Gemini, I headed back to the Realm of the Galaxies in the east. Over there, I had plenty of triumphs despite building haze and more clouds—M51’s arms, for example, were easy and so was the black spot of M64. I even thought I could see M87’s jet, barely. To sum up, I am intrigued by the Micro-EX, but want to withhold final judgment till I can get it under a clear, dark sky. Maybe in Chiefland next month. What can I say about it thus far? It is inexpensive, seems plenty sensitive, and is easy to operate. Let me restate the obvious: THIS WAS NOT A NIGHT FOR GALAXIES –or anything else, really. I felt like I should include a screen-grab, but the camera should be able to do far better than this on any decent night. Did I miss the larger chip of the Xtreme? Not really. After a while, I actually forgot I was using a “small chip camera.” Do understand: this is an inexpensive beginner camera, an uncooled camera with a 1/3rd inch chip. There will be prominent hot/warm pixels. As I have said before, however, that doesn't bother me. What I want to do is go deep and see plenty of details, and I believe the Micro is gonna let me do that. Stay tuned, y’all. At 10 p.m., the clouds had closed down the last sucker holes, and it was Big Switch time again. I wasn’t at all put out, since I hadn’t expected to see anything Saturday night. Coulda stayed out on the field schmoozing with the bubbas, but the bugs were beginning to bite, so it was DVDs back in the room till round midnight. One of the greatest things about being retired came with the morning. I didn't have to rush with packing to get home early to prepare for work on fraking Monday. I took my time, had a nice breakfast of French toast and bacon, and was just about whistling a little tune as I finished loading Miss Van Pelt. I even found the second of my two room keys; the one I’d thought I’d lost was lying in Miss Van Pelt’s cargo area. The drive home from a star party by myself is never particularly pleasant. I just want to get it over with. This time wasn’t bad, though. I finished listening to King’s tale of little lost Patricia, and ruminated on the things I’d seen. The Edge 800 and the Xtreme had placed a slew of objects both strange and wonderful before me, but, actually, what had me more excited was the Micro-EX. One of my favorite things in amateur astronomy, maybe my absolute favorite thing, muchachos, is seeing how much I can do with how little. The Micro is small in size and price, and while, yeah, I’ll have to get it under a good sky for a real test, I believe little sister is going to do one hell of a lot. Nota Bene: You can see many more pictures from the Scrimmage on Unk’s Facebook page (in “albums”).